A while back I got a card in the mail from Rory's mom. She had included all sorts of pictures of Rory when he was a baby and when I looked through them, I could envision similar shots from my family's albums. 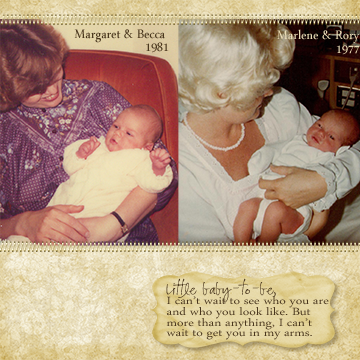 So this weekend I started to play, scanning all of her pictures and matching them up with pictures from my babyhood. It's so crazy to be in this place, not knowing who our little life is, but aware that when this baby arrives he or she will come with their own personality, their own temperament, and reflect bits and pieces of Rory and me. There is so much awe and wonder filling our days lately, as we talk excitedly during this season of anticipation.